This is a city where the dollar figure mentioned above doesn't seem like much. I've seen ten times that amount raised in a couple of hours at an evening gala. For such a humble figure, though, it does something amazing. It can keep our local homeless population warm for the winter. If you've been reading this blog regularly you know I've had a couple of occasions to spend some time with our local homeless population. The last time, at Homeless Connect, was perhaps one of the most impacting days of my adult life. I spent part of that day meeting people living on the streets, who told me stories of illness and trauma, and yet, of happiness and of family found on the streets. I listened and I learned so much, people. One of the most crushing things I learned is that some of these people spend their entire winters on the street. Some even sleep in tents in the brutal winter cold. I was stunned. I suppose I'd always suspected this but hadn't really given a lot of thought. That day I did - and every day since. When the Centre of Hope, an organization that has come to be very close to my heart, announced their $25,000 Below Zero campaign I knew I had to do what I could to help. The Centre has determined that keeping someone warm for the winter costs about $50. For that $50 they can have a toque and mittens and scarf and boots and coat. It's more than that, though. For that $50 they can know that they have not been forgotten. They know that someone out there cared enough to donate that small amount in order to keep them warm. Tonight I will speak to the Intrepid Junior Bloggers. We are very fortunate, my family and I, and we have not only warm winter clothing but so many non-essential, unnecessary things. We spend money on frivolous things (shoes, in my case). Tonight, though, I will suggest that we each take $50 and donate it to the $25,000 Below Zero campaign. I will suggest that this will be our family Christmas gift to this community, and to a group of our citizens who have captured my heart this year. I will do this because I care about everyone in this community, including those who have declared it home even when they don't have a home in it. I would like to take this opportunity to encourage all my readers to consider donating to this campaign, too. It might not be quite like giving someone a gift directly - it's better. It's like being the ultimate "Secret Santa", knowing that out there is someone who has received your gift, but that it's a gift better than perfume or a tie. It's the gift of warmth in a cold winter. It's the gift that reminds someone who may feel forgotten that they have been remembered. It's what the true meaning of this season is. It's about warmth, and generosity, and caring, and compassion, and inclusion. The campaign runs until March, people - but in my mind it's become linked to this season of giving. Tomorrow I am delighted that I will attend the Centre of Hope's Christmas Party for their patrons. I've been to some fabulous parties this year - and yet I think I am more excited by this party than any other. I am excited to maybe see some of the folks I met at Homeless Connect, and to hear even more stories from those who want to share them. I am excited to share some of my Christmas with them. I am excited to spend some time with people in this community who touched my heart, and who have impacted my life in a way I didn't anticipate. I am simply overjoyed at the chance to wish them a Merry Christmas, and to hopefully see some of them in brand new winter coats and boots. You might not be able to join me at the party, people, but you can get that feeling, too. 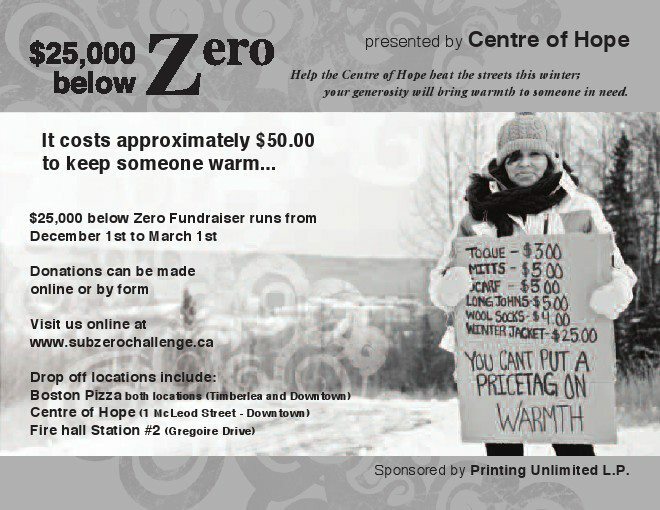 Head on over to the Centre of Hope Sub-Zero Challenge and make a donation. You don't need to do it for me, people. You don't even need to do it for them. Do it for the feeling it will give you, the joy that comes from clicking that donate button, and the sense that you have made a difference. 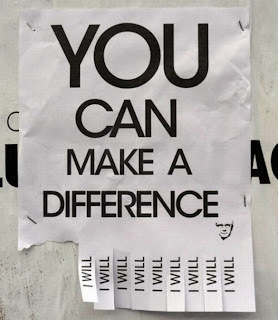 Because you can make a difference, people. If I've learned nothing else this year, I've learned that - and what an amazing lesson it has been. Theresa, the Centre is so fortunate to have your love. I am going to take a few highlights from this post, if you dont mind, and share them with our patrons this afternoon and tomorrow morning. It means so much to the staff and Patrons of the Centre! Although i live in Medici9ne Hat, I have spent quite a bit of time in Fort Mcmurray in the last full year,with my grandson and his mom and dad,I have worked mon to fri in the soup kitchen at the Baptist Church on Franklin, with a new church group each day, It has been an enjoyment for me, and yes i have seen some very cold people in there, and given away my share of mittens ,(mostly pinks so to the girls) LOL, but to end my litte excerpt, even from someone who does not live there, you can make a difference, even from a small start, every small start adds up till it is a huge end!!! take care Fort Mcmurrians, I have enjoyed helping out there,and hope to return in the future..